The European Commission has refused to call the 1915 events a "genocide" following the European Parliament’s resolution on the contrary. The European Commission, the 28-nation-bloc’s executive body, referred to the 1915 events as a "tragedy" Thursday, in defiance of the European Parliament’s resolution to recognize the event as "genocide" Wednesday. 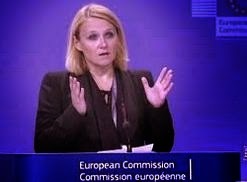 European Commission spokeswoman Maja Kocijancic reiterated Thursday European Commission Vice President Kristalina Georgieva’s remarks Wednesday. Georgieva told the European Parliament Wednesday that the EU "fully acknowledges the significance of the upcoming commemoration as well as the divergence of views over this tragedy." Turkey and Armenia disagree on what happened during the events between 1915 and 1923, with Armenia saying that 1.5 million people were deliberately killed and Turkey saying the deaths were a result of relocations and civil strife. The European Parliament first recognized the 1915 events as "genocide" in a 1987 resolution, which the parliament reiterated in a vote Wednesday - the centenary of the 1915 events. "What happened a hundred years ago continues to be felt in this century and to negatively affect Armenian-Turkish relations," Georgieva told the parliament Wednesday. Kocijancic told reporters in Brussels Thursday: "(In the European Commission) we stress the need for reconciliation, we stress the need for debate, we stress the need for additional steps that need to be taken and we stress the need for normalization (of relations) between Turkey and Armenia." Turkey has repeatedly rejected the EU's definition of the event and has pointed out that Armenians died during a relocation process in 1915 during World War I when a portion of the Armenian population living in the Ottoman Empire sided with the invading Russians and revolted against the empire. Pope Francis said Sunday that “the first ‘genocide’ of the 20th century struck Armenians," a statement which triggered criticism from Turkey and led to Ankara recalling its ambassador in the Vatican and also summoning Vatican's envoy in the Turkish capital. educador e seus alunos escolhem uma amolação. We checked XMovies8 for scam and fraud. Solarmovies Add-on. seja sobre os mesmos tópicos? Muito obrigada !! What's up it's me, I am also visiting this web page daily, this site is really nice and the visitors are genuinely sharing fastidious thoughts.